A new Grain stream cipher, denoted Grain-128AEAD is presented, with support for authenticated encryption with associated data. 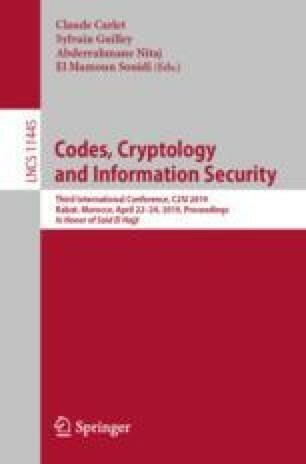 The cipher takes a 128-bit key and a 96-bit IV and produces a pseudo random sequence that is used for encryption and authentication of messages. The design is based on Grain-128a but introduces a few changes in order to increase the security and protect against recent cryptanalysis results. The MAC is 64 bits, as specified by the NIST requirements in their lightweight security standardization process. M. Hell, T. Johansson and J. Sönnerup—This work was in part financially supported by the Swedish Foundation for Strategic Research, grant RIT17-0032 and grant RIT17-0005. The message stream is given with the padding included. A padding bit of 1 equals a padding byte of 0x80. Note that for an empty message, the message stream is just the padding.